Sometimes you don't even need to try to find something unusual. This was one of those occasions and it always seems this sort of event happens when I'm not on familiar ground. After my three week work trip up to Fort McMurray, I dropped in for a visit at my uncle's place at the south end of Calgary in a community called McKenzie Towne. Today, I offered to take my uncle and grandma out to lunch so we headed out just after noon. 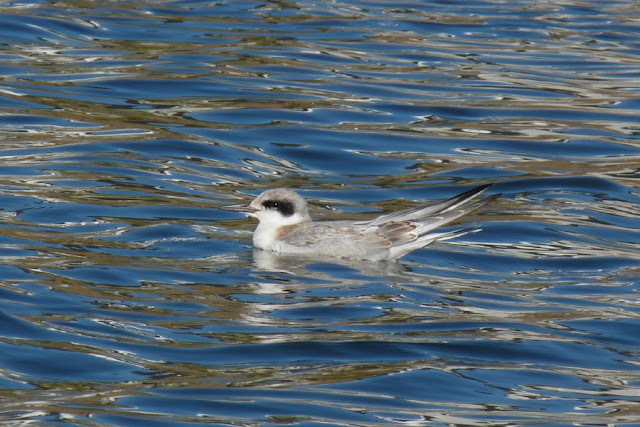 While my uncle drove, I looked over at a small pond just around the corner from his place and I noticed a tern fluttering over the water. I was quite surprised as I thought all the terns would have passed through already. Then again, I don't really know the typical windows of all the birds in this unfamiliar territory. I decided I would wander over when I got back from lunch. After lunch, I looked in the corner of the pond where I saw the tern darting about, but it was nowhere to be seen. I decided I would walk to the far end and see if it was by chance just out of view. 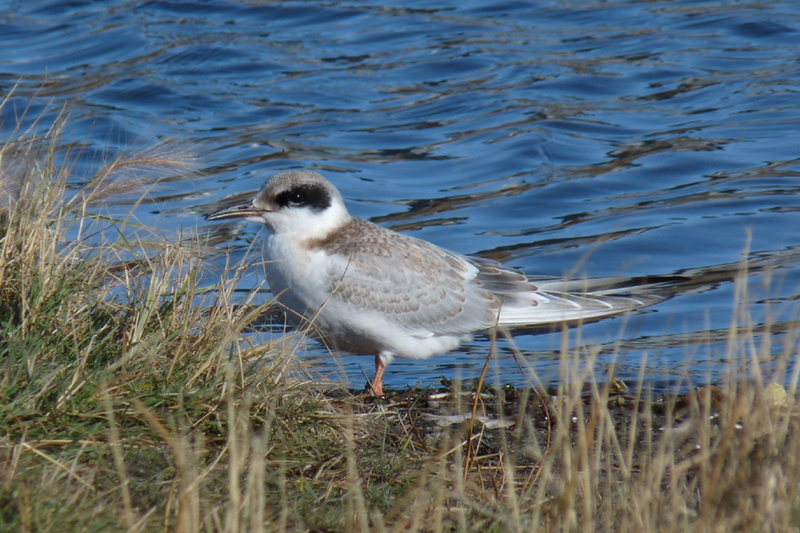 Once again, the tern wasn't immediately obvious. I scanned a little patch of muddy shoreline at the far side and was happy to see not one but two terns. 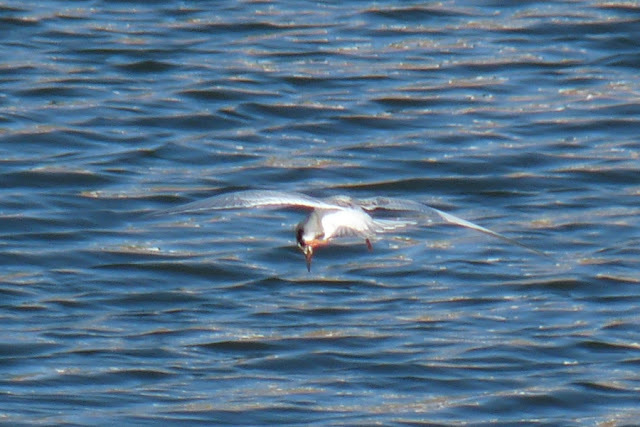 Being from British Columbia, I am not very familiar with Forster's Terns (Sterna forsteri), but I know they have a black smudge over their eye as juveniles and non-breeding adults. These two fit that description and I felt confident that's what they were. I took some very distant record shots and then worked my way around to get better shots. I only had a work camera that doesn't function properly, but still managed some decent shots between two visits this afternoon. This Forster's Tern shows the classic black smudge over the eye, while the brown-tinged scalloping on the back points to this being a juvenile. Without a DSLR handy, I only made a couple attempts at catching them in flight. On this occasion, I happened to catch it scratching! 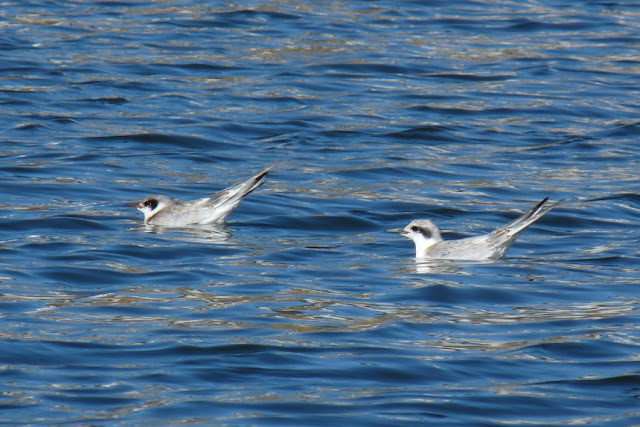 I rarely see terns land on water, but I watched the two juvenile Forster's Terns land on the water twice this afternoon. Finally, here's a shot of the two juvenile Forster's Terns together in the same frame - what a nice and unexpected find! Looking back over eBird, I can only see one report entered for Forster's Tern between October and November in the past decade. This does not necessarily reflect reality as many people probably did not go back and enter in their older notes into eBird. It does, however, give an indication as to how rare it is to find this species in Alberta at this time of year. This year, you can see that all records of Forster's Terns in October are well south of the two I encountered today (although I don't know if the link will get updated or not to reflect my record). I don't have much to add, but I figure I may as well add a shot of one of Calgary's dirt birds that we only get on Vancouver Island on very rare occasions. This is one of those birds that everyone takes for granted if you live around them, but you see them in good light and they are just the most spectacular birds! 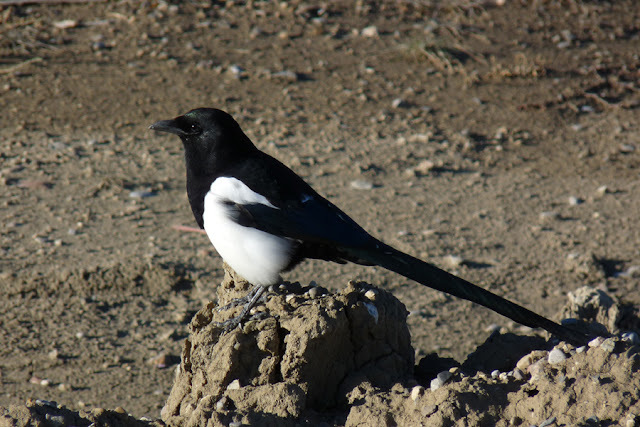 Unfortunately the light wasn't hitting this Black-billed Magpie (Pica hudsonia) quite right, but they're striking birds regardless of how the light hits them! I have enjoyed some of the sights I've taken in over my stay in Alberta, but I'm excited to get home and start taking photos of some of the fall birds in Victoria.